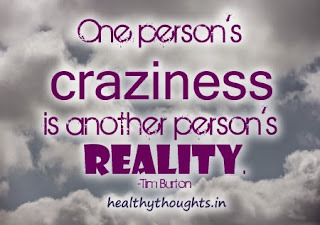 Inspire Bingle: Craziness of Life..!! It's being pleasing sharing my ideas with you. Let me tell you something great about life. In life there are mostly three things that are happening with you in your life. One is the thing that makes you happy, Second one is that makes you feel sad and another one is that neither makes you happy nor makes you sad. There are people that are always there for you for making you happy without any selfishness and other are that who always try to make you feel sad, unhappy and guilty. But it depends upon yourself how you are going to treat all this people in your life. Everyone is saying that always be positive, but sometimes when i am setting alone and observing people around me it makes me feel like does all those people who are happy have defined their life's goals and desires? Who knows and that's why i started asking them one by one and the result was the same that i had expected. People who are happy and cheering up their answer was that they love their life and people around them, no matter how they treat them but still they love them and try to maintain a healthy relation with each other. They have also told me that we just love to bring love and happiness in other people's life. While some people around who were not looking happy they have told me that the only thing that matters in their life with other people is that they treat the other people in the same way they have treated them. If someone treat them good then simple they will also treat them in the same way. But if anyone who is not treating them well then they will also not respond in a well manner. So, here all i am trying to say is that no matter how people are treating us in our life, but we should treat them all equal and in a good manner. We should try to bring happiness in their life as well as in our life. Don't just try to make them happy but should also bring everyone closer to each other and build a great relation. Next time when you go around and look people that are around you and try to observe them and so you will also get some idea about why and how to bring happiness in other people's life!! Oh,wow have you observed that you have already started observing yourself and so you have started to care other people in that are in your life and of whom you care about. 7 Keys to a Flawless Conversion. 10 inspiring quotes, one must read.